Dr. Allen and Dr. Danner were both selected to speak at the NFO conference this year. Please click the link below to see the slides on their talks! 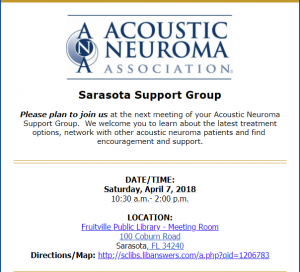 Dr. Danner will be speaking with the ANA Sarasota support group on April 7th, 2018. Many benefits can be gained from a supportive group environment. Family, friends, caregivers and interested persons are encouraged to attend.